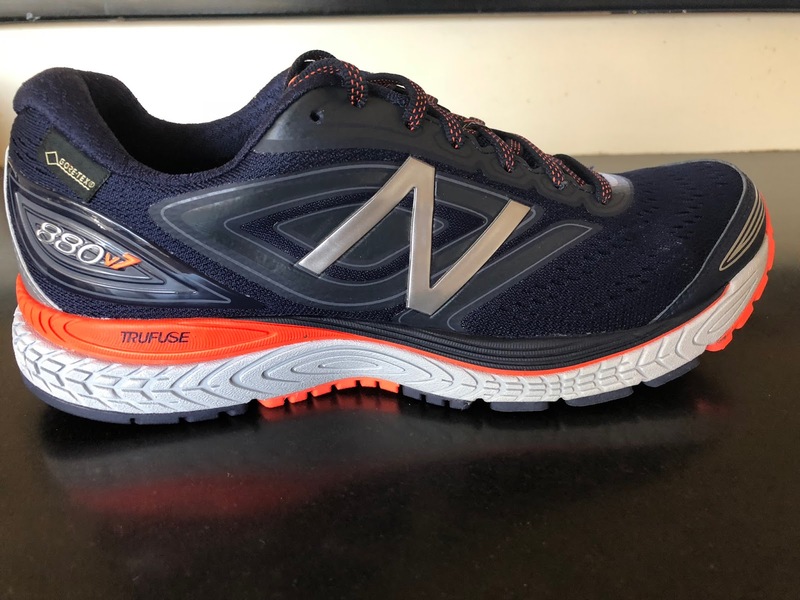 The New Balance 880v7 GTX is a stable neutral daily trainer designed for long steady runs and durability. 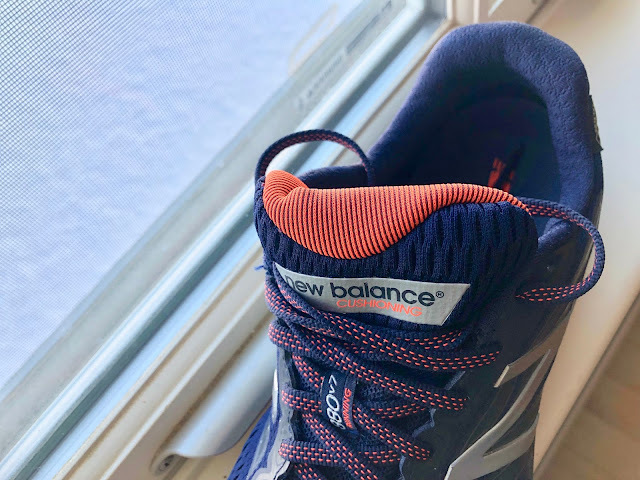 Is is amply and fairly firmly cushioned, has plenty of outsole rubber and a very supportive, maybe overly supportive upper in the GTX Gore-Tex version I tested. The ride is smooth with a distinct flex point if a bit ponderous due to its 11 oz weight. 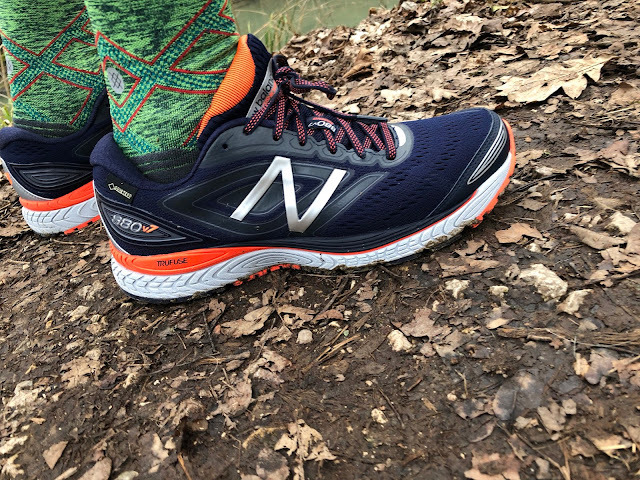 Despite not having a trail outsole, in all other respects, it is also be a fine choice for smoother trails and dirt roads due to its support and stability. The 880v7 GTX fit me true to size if a bit snug over the mid foot initially. There is plenty of very well held front of the shoe toe room and overhead. This is one substantial shoe from top to bottom. It shouts I will be with you for many miles. The upper has extensive, wide, stitch free overlays, the True Fuse midsole is thick and dense, the outsole almost full coverage. The fit of my sample Gore-Tex upper 880v7 GTX was true to size if a bit snug over the instep for the first few runs. The Gore-Tex part is a bootie which likely contributes to the snugness and when bending the shoe in hand one hears it crinkle. While a very fair $10 over the standard version, this shoe would be lighter, fit better, flex better, and likely have its breathable waterproofing perform better over time with the newer Invisible Fit Gore-Tex where the membrane is laminated directly to the upper. The upper is made of a soft engineered mesh upfront. I say upfront as there are so many 3D resin overlays at mid foot that the mesh there is practically invisible. These overlays are fairly thin and broad but in no way minimal. They provide outstanding mid foot support, so outstanding that I would say for a road shoe they are over done. 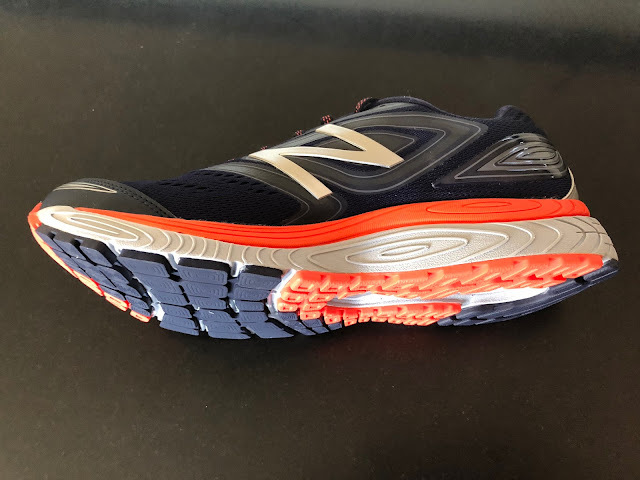 Of course this support also makes the 880 very supportive on trails or for those who need a touch of pronation support via the upper as well. Interestingly, the non Gore-Tex version has a considerably lighter pattern of overlays. I am not sure why the heavier overlays were specified for the GTX version. Makes no sense to me. I can't wait to try the non Gore-Tex version. The Gore-Tex bootie in my pair contributed to making the upper stiffer flexing up front than the standard version. I ran the GTX in moderate temperatures in the lower to mid 40's Farenheit and was comfortable and never overheated. The toe bumper is the only stitched on part of the upper, beyond the lace throat. 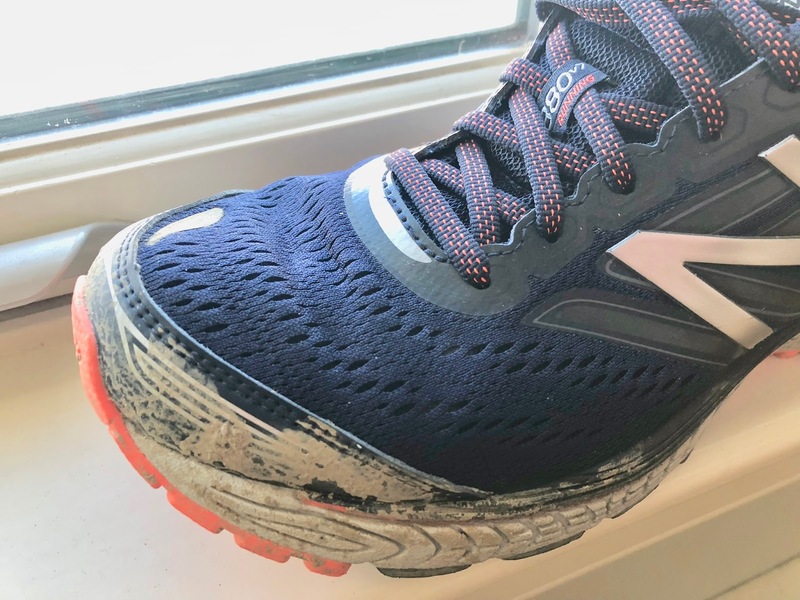 The bumper is vertical and fairly stiff (again good for trails) and helps provide toe overhead room but doesn't cause any over the top of the toes pressure which can occur with stiff toe bumpers. The tongue is a puffy style yet despite appearances has some structure a slight rigidity to it, maybe the Gore-Tex? It is stitched to the upper all the way up to the last lace hole. The design contributes to not only a great lace up comfort but to wrapping the foot seamlessly, and well, unlike many soft puffy style tongues. The ankle opening and achilles collar are well and firmly padded. Again no over plush slop there so a rock solid comfortable rear of the foot hold. The heel cup is extremely firm and supportive. No slip or instability at any time or on any surface. 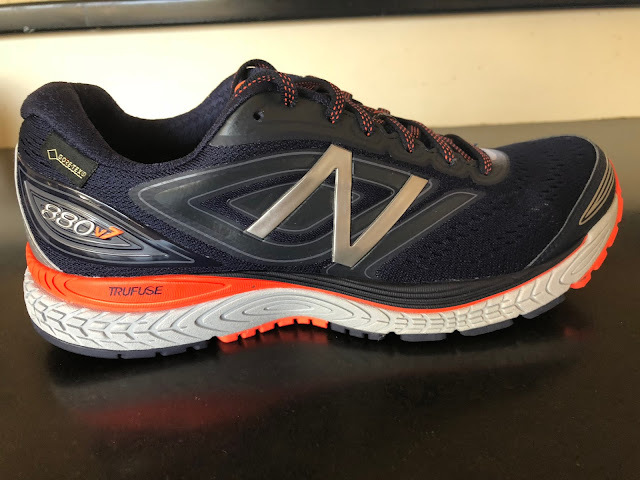 The midsole foam is called out as New Balance's TruFuse technology: "ultra-responsive TruFuse midsole foam provides a dynamic fusion of cushioning, responsiveness and durability mile after mile." While I cannot yet comment on the durability, this blend of two foams is notably responsive while decently cushioned. It is by no means a soft foam. I prefer it to Fresh Foam in the comparable 1080 as it has more responsive pop. 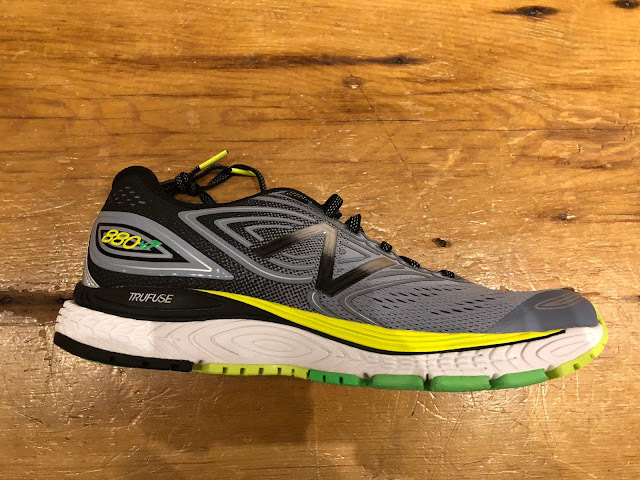 If you like RevLite in New Balance performance shoes but want a touch more cushion feel and maybe a touch more bounce you will like TruFuse. There is no apparent difference between the medial and lateral side midsole wall geometries so while the 880 is plenty stable nothing is forced in that department so 880 is resolutely neutral geometry with inherent stability from the rest of the design. The outsole combines New Balance's Ndurance hard rubber at the blue heel, with from what I can tell all other areas, despite color differences, a somewhat softer blown rubber. 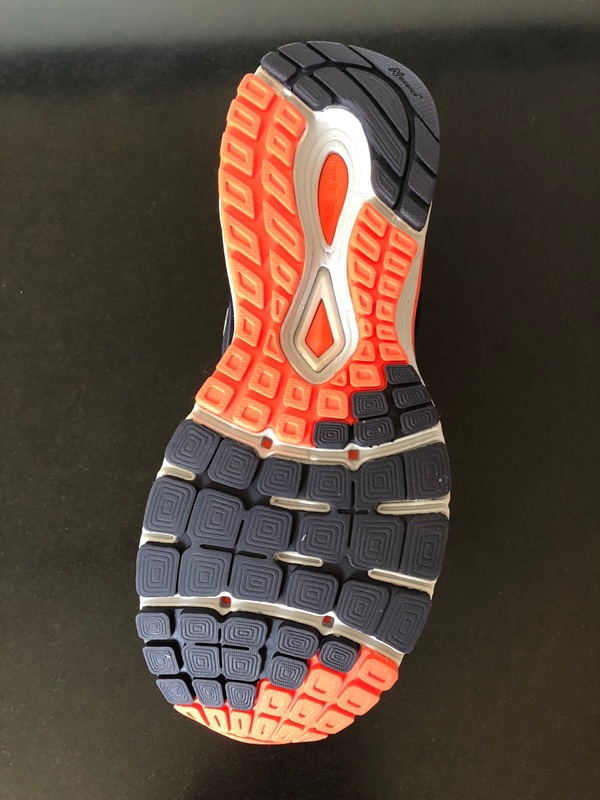 The outsole is well segmented, contributing to the very decent overall flexibility of such a big and relatively firm shoe and transitions smoothly and especially well at slower paces, often a challenge in such shoes. This is a workhorse ride. Nothing flashy and fast here. Just solid support and cushion. I ran up to 15 miles in the 880 at moderate paces. I plowed through pavement, dirt roads, a few trail miles, and even some mud and wet fields just fine. I even ran in and out of two countries Switzerland and France with no issues! I was never the worse for wear the next day in the 880. Exciting, No. Steady and reliable, Yes. The shoe's weight was noticeable but in the later miles of my long run I appreciated the steady support and reliable cushion. The 880v7 GTX is a fine choice as a durable daily trainer. It is fairly priced in comparison to competing "premium" trainers which are often at $150 and should be just as durable if not quite as plush as the premiums. I'll skip the over plush any day! 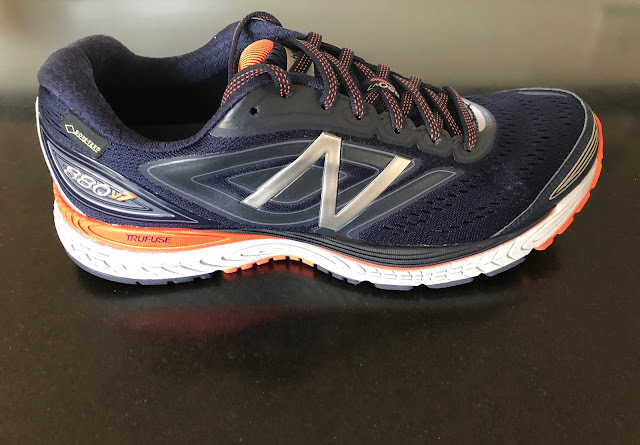 It is a great option if you do high mileage, want a supportive shoe but don't want "stability" features such as firmer medial foam and if your runs are on varied terrain including dirt roads. As called out by New Balance, there is no question the 880 is responsive if not exactly "plush" its cushion. So if serious and steady is your preference it is a great option. Very popular at run retail, it is also a good choice for beginner runners and heavier runners due to its support and substance. The 880 could be improved by simplifying and lightening the upper. There is plenty of underfoot support here. The 1080's simpler, lighter, and more elegant engineered mesh upper with fewer overlays would improve the comfort of the shoe and maybe shed a little weight. I would also like to see a lower profile, lighter version of this shoe in the 10 oz weight class as a performance trainer. -0.5 for weight. This shoe needs to get down to 10.5 oz or less. -0.5 for crinkly fairly stiff bootie style Gore-Tex. This shoe needs the newer Invisible Fit laminate. -0.25 for excessive overlays at mid foot. Why weren't the same overlays as in the non GTX version used? Only very slightly lighter at 10.9 oz, the 1080 is an obvious comparison. The 1080 has a more forward and stiffer flex and as such I found it was harder to run, more labored at slower paces than the 880. The 1080 has a superior upper but this did not outweigh the smoother transitions of the 880 and its overall better flexiblity. Nod to 880 and you'll save money too. The Skechers is a much, much lighter cushioned shoe and I doubt it will last as long. 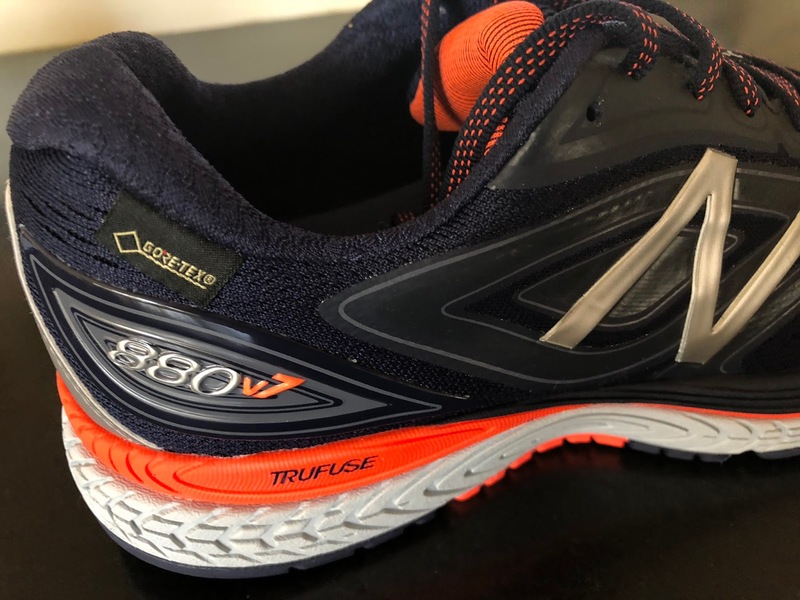 I’d say that the 880 retains a bit more road feel and feels like a more standard running shoe with its non rocker transition and flexibility. The Skechers upper is notably superior in its comfort. Toss up depending on intended uses, need for support and fit. 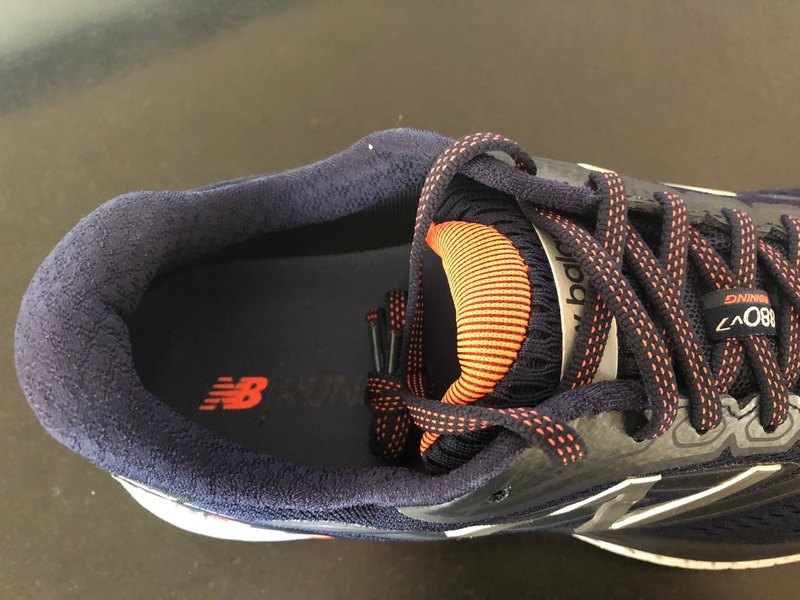 While the Nimbus also has decent flexibility, the package of midsole and gel is not as seamless on the run although shock is a bit better attenuated in the Nimbus due to the Gel inserts. The Nimbus upper is fine if you want lots of support but for me is overbuilt and somewhat constraining even compared to the 880 GTX. Pricer and worth it, the Levitate gets the nod for its superior upper, if not quite as wide at the very front as the 880. The piston like midsole of the Levitate combined with decent flexibility and support is more enjoyable at all paces. Interestingly the 880v7 upper while overbuilt and a bit snugger overall fits me a bit better and more securely. The Triumph's is a bit on the soft side at mid foot, constraining over the last lace up and harder to dial in. Underfoot the Triumph is stiffer, slightly more energetic and softer due to the TPU midsole foam and is a faster shoe by a small margin. This said and overall I give the 880 a slight nod for its lower price, flexibility and responsiveness, again wishing it was lighter. Sam Winebaum is the Editor and Founder of RoadTrailRun. He has been running and run shoe geeking for 45 years. As he turned 60 in 2017 he was thrilled to clock a 1:35.24 half. The 880 was provided at no cost. The opinions herein are entirely the author's. Visit our 2018 Previews Page here for 2018 run shoe, apparel, and gear previews. Thanks for another great review. Nike Epic React Flyknit Review: Hype! Hype? Hype.